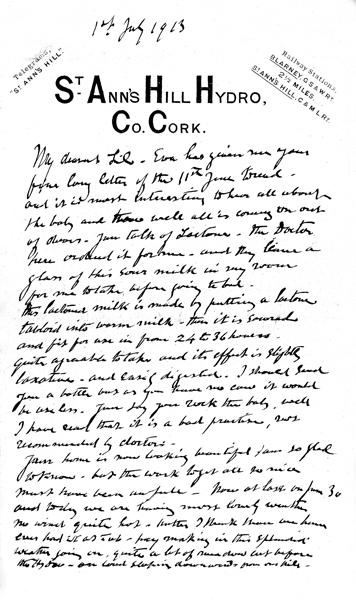 Eva has given me your fine long letter of the 11th June to read and it is most interesting to hear all about the baby and how well all is coming along out of doors. You talk of Lactonic. The doctor here ordered it for me and they leave a glass of this sour milk in my room for me to take before going to bed. Lactonic milk is made by putting a lactonic tabloid into warm milk. Then it is soured and fit for use in from 24 to 36 hours. Quite agreeable to take and its effect is slightly laxative and easily digested. I should send you a bottle but as you have no cows it would be useless. You say you rock the baby – well I have heard that it is a bad practice, not recommended by doctors. You home is now looking beautiful I am so glad to know but the work to get all so nice must have been awful. Now at last on June 30 and today we are having most lovely weather, no wind, quite hot, better I think than we have ever had it as July – hay making in this splendid weather going on, quite a lot of meadows cut before the Hydro – on land sloping downwards from our pile. Weather fluctuations so well on the chart and the changes are indicated at the hour they occur. I will write to CSSA to send you out a secateur. I see diagrams of these in their price list and will choose the one that looks the best. Improvements are often being made in their instruments. I am sorry to hear that Charley’s back still hurts. You must not let him do any hard work or it would take ever so much longer to get over the strain. I got a nice selection of roses last November, small plants but they are doing well, just now coming into bloom. ’Trish Elyanah’ has such a pretty bud and when plucked it opens nicely in the house for table decoration. ’Karoline Testouth’ has a grand blossom. My bees did badly in the Winter. I lost them all. An expert came around and said they were queenless, so I got a strong swarm last month and these are doing well and have given off a swarm which we have got all safe in one of the empty hives. Charles Rolleston broke his hip in falling and the shock killed him. The garden is now looking very pretty, a lot of anthurinums coming on, which will give a glow of bright colour presently. Strawberries now in plenty – peas, our first dishes. The new recreation grounds at Whitewell are getting on but a lot more work to be done. Just now they look so bad from this, all a mess of terraces – patchy upturned earth – they say twenty thousand pounds will not cover the expenses when all is done. Today is Tuesday (2nd July) and we shall be returning to the North on Friday. I am all the better of this treatment, not so stiff. Yesterday I could have walked but George and Eva wheeled me down to the railway light station and there we boarded the train for a few minutes run to the golf grounds where I watched the play and we had tea with friends in the golf club house. Altogether a most enjoyable day. I wish Charley could get some massage for his back, it would probably set him all right again, that and rest. Your nurse must be a treasure to agree of her own accord to stop with you in this trying time. She likes the life and will perhaps marry and settle in the country. What do you do for bread? Have you built an outdoor oven yet? It is easy if you had the bricks. Of Joe I have heard nothing since we left. Eva is going to write and will no doubt give news which I have omitted. I am writing on my knee out of doors. Rather shakey writing. Have you got the article I sent you in May to commemorate baby’s birth? Have just heard of the death of Major Rolleston – suddenly – have not heard particulars but it appears he fell and the shock and hurt affected his heart – we have not heard directly – a lady in the Hydro told me. Quatsino homestead in a noose of light. Hasten, or I’ll cry and shout just more and more. Dr Richard Barter opened St Ann’s Hydropathic Establishment in 1843, despite opposition from the Irish medical faculty. St Ann’s Hydro was greeted with every form of ridicule and contempt, yet patients dropped in one by one to attend ‘the mad Doctor’ and St Ann’s Hill Hydro soon had many residential patients and was accessible by train and sedan chair from Blarney, until the arrival of the Cork-Muskerry Tram in later years. The Hydro was at its peak from around 1880-1920 and at one stage had around 80 bedrooms. Fresh food was provided from its own 200 acre ( 81 Hectare) farm. ST. ANN’S HILL HYDRO, CO. CORK. Situated on rising ground, and well sheltered by tree-clad hills, St. Ann’s is in the midst of one of the most beautiful districts in Ireland. A special feature of the hydro is its home-like character, coupled with first-class accommodation and all the comforts of a private country house. For invalids, and those in search of absolute rest and quiet, it is ideal. The winters are very mild. The grounds and woods are extensive, and the public apartments embrace a Drawing Room, Reading Room, Smoking Room, and Ladies’ and Gentlemen’s Billiard Rooms. There is also a circulating library, a theatre, an American bowling alley, covered tennis courts, three grass tennis courts and a nine hole golf course. The baths comprise of Turkish, Pine, Brine, Nauheim and ‘ Vichy Douche ‘, all under the direction of the Resident Medical Superintendent. A new Turkish Bath was opened on Wednesday at St. Ann’s Hill, Blarney. The new building is situated on a terrace below the main building, and for style of architecture and beauty, excels anything of the kind ever seen in this country. The baths occupy a space of 180 feet (55 m) by 36 feet (11 m) and consist of two complete sets, one for ladies, and the other for gentlemen. The entire building has an exceedingly classical and imposing effect externally and internally, and is built in a substantial and permanent manner. The division walls of the sanatorium have piers of Caen stone carved, and styles panelled in red Cork marble, the capping of the top rails being polished Sicilian marble. The flooring throughout is laid in red marble, also giving a beautiful effect to the building. Onthe gentlemen’s side of the structure the wall dividing the hot room from the cooling chamber is broken by a circular-headed opening 12 feet by 6 feet filled with a single sheet of plate glass. These noble rooms are decorated in the highest style of architectural ornamentation. Much use has been made of mirrors and stained glass in the construction of the building, which, combined with the rich tapestry, gives it internally quite an Oriental appearance. The architectural beauties of this magnificent establishment are due to Dr. R. Barter. Richard Barter was born in Cooldaniel, near Macroom, in 1802. He studied medicine and qualified with distinction at the London College of Physicians. His first vapour bath set up at St. Ann’s was nothing more than a box in which the patient was subjected to vapour heat up to the neck only – the head being outside the box. Subsequently he made a bath after the Russian model that allowed the patient to endure 15 degrees of heat more than in the first bath. When the news of the venture got abroad, St. Ann’s Hill was called a “vapour establishment” by the enemies of vapour baths who also referred to Dr Barter as “the mad doctor”. Dr Barter died on the 3rd October 1870 at the age of 67. Members of the Barter family continued operating the Hydropathic Establishment at St Ann’s Hill, until it was sold in 1952. Today, all that remains is a few forgotten scattered ruins.